As the principal defence event in Canada, CANSEC 2018 started with a buzz revolving around the announcement made on the first day by Minister of National Defence, Harjit Sajjan. During his keynote address, Minister Sajjan announced a new Defence Investment Plan, which is an add-on to the new Defence Policy that was announced last year, Strong, Secure, Engaged. This plan has an online component with a searchable database of more than 200 contracts for industry to access. CANSEC, an event hosted annually by the Canadian Association of Defence and Security Industries (CADSI) since 1998, was held over two days at the EY Centre on May 30-31, 2018. Built on the success of the previous two decades, CANSEC once again was the hub where vendors, military, coast guard and police officials converged to learn about and further the discussion on leading-edge technology, products and services for the different domains within military. With a display space of 150,000 square feet, 300 companies exhibited their products and services to about 11,000 attendees. Networking, keynote addresses, presentations and business meetings, all played an integral part in the collaboration among key players in helping to mould the Canadian Armed Forces for years to come. Some companies used the opportunity to announce partnerships, innovations and new products and services. Under its National Shipbuilding Strategy (NSS) commitments, Seaspan Shipyards announced that work will begin soon on the Joint Support Ships (JSS) for the Royal Canadian Navy (RCN). These ships will execute an indispensable role in meeting the obligations of Canada both domestically and on the international scene. “By starting construction on the JSS, our company is supporting the operational needs of the RCN and the long-term success of Canada’s shipbuilding industry,” said Brian Carter, President & CEO of Seaspan Shipyards. During CANSEC, Viasat Inc., a global communications company, conducted its first international defence-focused ViaSat-2 system demonstration. This was attended by members of the CAF who witnessed first-hand cloud-based applications and services delivered over Viasat’s secure, resilient, high-capacity SATCOM network in Canada. Ken Peterman, President, Government Systems for Viasat said that they are proud to demonstrate emerging military and government concepts of operations requiring bandwidth-intensive, cloud-connected applications with their latest high-throughput commercial satellite, the ViaSat-2. General Dynamics Mission Systems–Canada declared its support of Team Rubicon Canada, an organization that deploys veterans to aid in disaster response operations around the world, by providing its EmergencySHIELD™. This is a communications equipment designed for disaster zones, which according to Bryan Riddell, CEO of Team Rubicon Canada, will be a game changer for their team. “Not having to rely on commercial communications systems, which are often unavailable during a crisis or disaster situation, will increase the effectiveness of our teams and improve their ability to provide assistance quickly,” he said. Saab showcased its Gripen E cockpit simulator at CANSEC. As one of the companies looking at Canada’s Future Fighter Capability Project to replace the CF-18s, Saab displayed the high-definition touchscreen of the Gripen E to show how data can be adjusted to suit the needs of the pilot during flight. Some of the other products and services on display during CANSEC 2018 included Textron Systems Canada 4×4 Tactical Armoured Patrol Vehicle (TAPV), Harris tactical night vision devices, Rheinmetall Canada Multimission Unmanned Ground Vehicle (MMUGV), DRS Technologies Canada new Centaurus shipboard Communication Control and Management System (CCMS), and Raytheon Specter 1X MRDS and Specter 1XL CQS. This piece first appeared in Vanguard June/July 2018 issue. To view the entire issue, go here. Marcello is the managing editor of Vanguard, IT in Canada and Canadian Government Executive and the host of Vanguard Radio and WRLWND Radio podcasts. He is an avid technology and security enthusiast, who has worked on content leadership strategies for a number of industries including the public sector, life science, technology and defence. 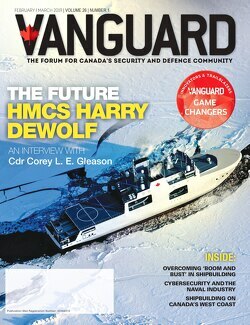 Vanguard is Canada’s oldest trade journal of record that provides a forum for Canada’s security and defence community, discussing strategic perspectives and overviews of government and military policy and practice, through interviews with leading practitioners and contributions from renowned experts, including representatives from industry.